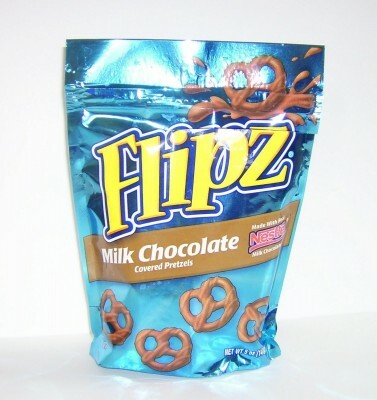 Flipz pretzels are tasty little chocolate covered treats that are usually sold in 5 oz bags. It’s easy to make a much bigger homemade batch of chocolate covered pretzels for the same price that tastes just as good as the Flipz version. I discovered this quite by accident. I had some leftover Candy Melts from the craft store and I decided to just melt up what I had left and then stir in some pretzels. And they turned out just like the Flipz pretzels that I love! Melt the chocolate in a large bowl in the microwave according to the package directions. Stir the pretzels into the melted chocolate until all pretzels are coated. Spread out on wax paper to cool. Store in an airtight container. The 14 oz bag of candy melts equals 3 cups of candies. I like the Candy Melts because they melt so easily, but baking chips could probably be substituted. You will want to separate the pretzels a little bit on the wax paper so they don’t harden up in clumps. The 5 oz bag of Flipz costs $2.29. The 5 oz bag equaled 2 cups of preztels. I spent $1.79 on the Candy Melts (using my 40% off coupon at Michaels Craft Store) and I spent 50 cents on the 8 cups of pretzels. This came out to $2.29 !! The same price for the 2 cups of the ready made stuff.